Repetitive Stress Injuries can be a real problem, especially if you are working in an office day in, day out. 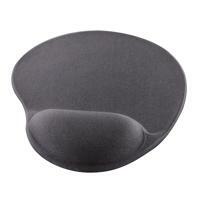 The Q-Connect Black Gel Mouse Mat is a perfect solution to that problem, with a gel filled rest that is designed to support your wrist and provide comfort. <br><br>The mat itself is extremely sleek and smooth, ensuring that your mouse runs over the mat with consummate ease and giving you a precise control over your computer.